One of Cavalier's earliest partners-in-beer was Proud Mary. 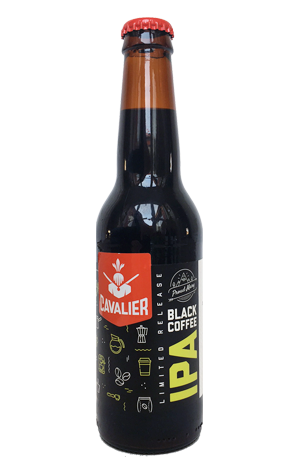 They hooked up with the Melbourne coffee roasters to create a Black Coffee IPA that debuted on tap at the Good Beer Week Festival Hub in 2013. The beer has reappeared on occasion since, with the winter 2017 version seeing a fresh tweak to the recipe. The roasters selected beans from the Yirgacheffe of Ethiopia for their stone fruit characteristics this time around, while the brewers opted for "a huge amount" of US hops Columbus, Chinook and Centennial. And, to the judges at Crafty Towers, it's the former that wins out in terms of upfront impact. The roasted coffee dominates, with the hop derived fruitiness lurking in the wings before, as the beer warms, the two combine into something akin to chocolate orange.